Danelec FZE participated in the Summit on Nigeria’s Free Zones and the Economy organized in Abuja, Nigeria by the National Assembly Anti-Money Laundering and Cyber Security Coalition in collaboration with Federal Ministry of Commerce and Industry. The event was held on the 2nd-3rd June, 2009 in Abuja. Danelec FZE exhibition stand which was visited by participants & the Hon. Minister of Commerce & Industry His Excellency, Chief Achike Udenwa who represented the President of Nigeria at the Summit on Nigeria’s Free Zones and the Economy organized in Abuja, Nigeria by the National Assembly Anti-Money Laundering and Cyber Security Coalition in collaboration with Federal Ministry of Commerce and Industry. Danelec FZE has been certified by SON and has been admitted as a member of Manufacturers Association of Nigeria(MAN). FUTO visit to Danelec FZE....on Friday August, 27th 2010. DanelecFZE exhibited her products at the Nigerian Society of Engineers' International Engineering Conference And Annual General Meeting "ABUJA 2010"
Standard design are those designs within the scope of the standard design programs and documented manual and spreadsheet-assisted calculation procedures. The implementation of plans for each standard design are the responsibility of the Order Development (ODEV) electrical and mechanical designers. Special design and development activities affecting product design are planned and implemented by the Engineering Manager and/or personnel assigned by him. Control Limit for critical measurable parameters have been established for certain processes. The required measurements, any special measurement tecchniques, control limits and measurement frequecy are documented on the system or in process operator or personnel collect and enter data on the system. when parameter fall outside establish control limit, the process measured is shut down and correstive action initiated per procedure. Inspection of test may be performed at material receiving, during production, at final test and at final inspection before shipment of product. Various methods, such as stickers, tags, physical location in designated areas and computer entries, are used to clearly indicate the inspection or test status of materials and product throughout the process and ensure that non conforming product is not used or shipped to the customer. Only product which has completed all required quality checks, or which has been released by the customer in accordance with our documented waiver procedure may be shipped. Other procedure provides an overview of inspection and test status indication. The various procedures for manufacturing processes and quality checks give details to how inspection and test status are indicated. Quality records are maintained to demonstrate conformance to customer specified requirements and the effective operation of the quality system. Our documented quality procedures define the quality records, who creates them and what form they are in. This information is distributed among the procedures which document processes initiating or adding information to quality records. Quality records will be maintained in a readable form and filed to facilitate necessary retrieval. Ease of retrieval will be consistent with likely need for access. Most records are maintained in electronic form where practicable. All records will be documented in a legible form and stored properly to prevent loss or deterioration. Quality records will be made available to our customers as required by contractual agreement. Documents policy to verify, protect and control application of parts supplied by our customers. Materials supplied by customers for use on their own units are handled using the same procedures as are used for materials purchase by Danelecfze, except that normal procedures for qualifying suppliers and maintaining qualification do not apply. A special part number, which associates the part with the customer's shop order, is assigned and used on the purchase order to ensure the parts are issued only to the customer's unit. Lost, demaged or non-conforming materials will be documented and reported to the customer. Our production facilities where all transformer are manufacture are certified acc to ISO 9001 AND ISO 14001. At the end of the manufacturing process the transformers are individually tested in accordance with the IEC standards. Specially designed reinforce transformers suitable for pole mounting.Protected with arching horns are tested with accordance with SFS 2646 steep wave execution. •Initiate action to prevent the occurance of product non-conformity. •Initiate and record any product quality problems. •Initiate,recommend and provide solution through designated channels. •Verify the implementation of solution. •Control further processing, delivery, or installation of nonconforming product untill the deficiency of unsatisfactory condition have been corrected. ....on Friday August, 27th 2010. On Tuesday March 16th 2010, the Nigerian Senate Committee on Industry, led by its Chairman, Senator Kamarudeen A. Adetibu visited the Danelec FZE transformer manufacturing factory in the Free Zone, Calabar. Other members of the delegation were; Senator Sati Gagin, Senator Kuta and Mrs. Obi. The General Manager, Engr. Chief Giandomenica Massari explained to them the process of transformer manufacturing and the local content that is involved in the manufacturing of the transformers. Danelec FZE is a leading Company in the manufacturing of three phase distribution transformers insulated in mineral oil resin. The company is equipped with machineries and tools necessary for the production of fine quality and reliable transformers. 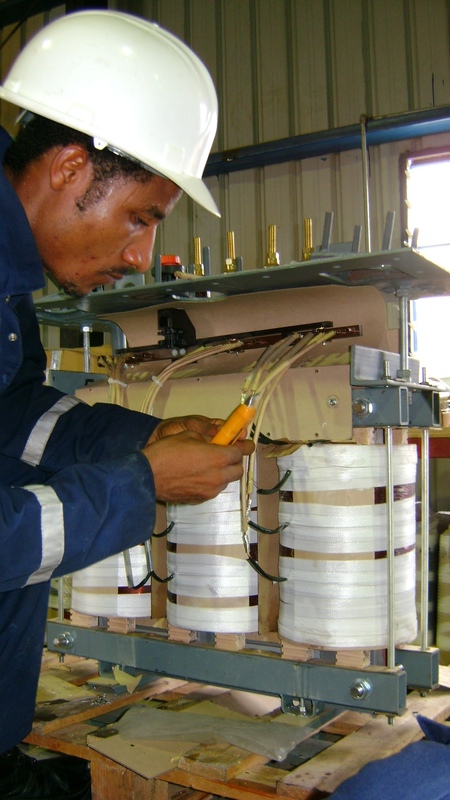 With its skilled foreign and indigenous staff, DanelecFZE is flexible and reliable in preparing transformers which can be mass produced and custom tailored.